Nidderdale, being one of the dales in the Yorkshire Dales, is the upper valley of the River Nidd but it does not lie within the Yorkshire Dales National Park. Pateley Bridge is Nidderdale’s only town but the villages of Wath, Ramsgill, Lofthouse and Middlesmoor lie above the town and below there are the villages of Bewerley, Glasshouses, Summerbridge, Dacre, Darley, Birstwith, Hampswaite and Kettlesing. Nidderdale was designated an Area of Outstanding Natural Beauty in 1994, and is really a stunning valley with the picturesque Scar House Reservoir just above Lofthouse, Stean and Middlesmoor. The dramatic landscape provides excellent walking, cycling, horse riding, llama trekking, bird watching or you can just relax and soak up the scenery. For the walker there are 820 km of public footpaths and bridleways from long distant routes such as the Nidderdale Way to easy strolls. For the cyclist there is a good network of quiet lanes and off road tracks as well as a section of The National Byway Britain’s heritage cycling route and there are also miles and miles of tracks for mountain bike riding. The new right of access came into force in 2005 and has allowed 200 square kilometres of access land to be walked freely. For the horse rider there is a bridleway network covering more than 170km. Llama Trekking is an unforgettable experience and Nidderdale Llamas run guided treks from two hour sessions to a full day trek. For the birdwatcher the habitats from moorlands and reservoirs to woodlands attract a great range of garden and passerine birds, wildfowl and waders. So the dale has much to offer to suit everyone’s ability and interest. Gouthwaite Reservoir was constructed between 1893 and 1901 as a compensation reservoir for the River Nidd, therefore maintaining the downstream flow of the river during periods of lower rainfall. The Elizabethan manor house, Gouthwaite Hall, the ancient home of the Yorke family, was submerged beneath its waters. Gouthwaite White Hall was rebuilt beside the reservoir with materials from the old hall and is now a Grade II listed building. Gouthwaite Reservoir, one of a many reservoirs in the Nidderdale area, is a Nature Reserve and a Site of Special Scientific Interest (SSSI). The reservoir attracts a wide range of wetland birds, small birds, waders, migrants and birds of prey. Tree and shrub cover along the shoreline provides the habitat for small birds such as willow warbler and black cap. Woodland birds like the great spotted woodpecker and nuthatch have been recorded. King Fishers are often seen when the water level is low and green woodpeckers live at the northern end of the reservoir. Canada Geese, mallards, Oyster Catchers and other waterfowl are common with regular visits in the autumn and winter from Gooseanders, Tufted Duck and from Iceland the Whooper Swan. Winter is also a good time to see Red Kite and Buzzard flying above the reservoir and the surrounding moorland and other birds of prey have often been sighted on passage. In the summer months the water level drops providing ideal breeding and feeding grounds for waders. The reservoir is owned by Yorkshire Water who has created three viewing areas for bird watchers on the western edge of the reservoir. Gouthwaite Reservoir is the reservoir featured on the opening credits of the UK soap drama, Emmerdale. Ramsgill is a small village near the northern end of Gouthwaite Reservoir. The Yorke Arms, a Michelin- starred restaurant, situated on the village green takes its name from the lords of the manor, the Yorke family, who once lived in nearby Gouthwaite Hall. The village Church of St Mary the Virgin was built in 1842 near to the remains of a Grade II listed medieval chapel which was originally part of a large grange built by the monks of Byland Abbey. Ramsgill had a railway station on the Nidd Valley Light Railway, located in the hamlet of Bouthwaite near Ramsgill. It opened in 1907 and closed in 1930. The Nidderdale Way and Six Dales Trail both pass through Bouthwaite. In the village of Wath at the southern end of Gouthwaite Reservoir you will find the Sportsman’s Arms Inn and a small Methodist chapel, built in 1859, which has an unusual 5 sided shape. The ford over the River Nidd was replaced by a bridge, Wath Bridge, by the 16th century. The present bridge, a narrow road bridge, dates from the early 19th century and is a Grade II listed building. Wath also had a railway station in the early 20th century on the Nidd Valley Light Railway. The River Nidd rises in Nidderdale at Nidd Head Spring on the slopes of Great Whernside in the Yorkshire Dales and flows for approximately 58¾ miles before it joins the River Ouse at Nun Munkton. In its first few miles the river is dammed three times to create Angram Reservoir, Scar House Reservoir and Gouthwaite Reservoir. In dry weather the river disappears underground into the sink hole known as Manchester Hole flows through the caves and reappears at the rising Nidd Head to the south of Lofthouse. 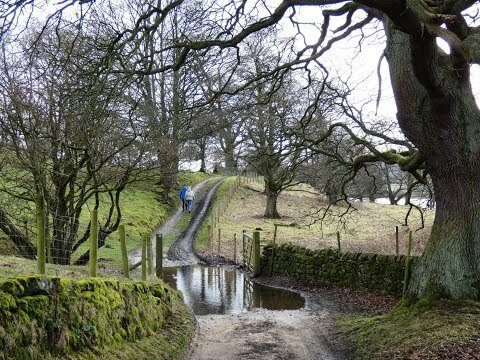 In wet weather the Nidd can cause the reservoirs to overflow and the underground caves in the valley become flooded which allows the river to flow along the normally dry river bed past Lofthouse through to Gouthwaite Reservoir. The river then continues through Pateley Bridge then meanders past Glasshouses, Summerbridge, Dacre Banks, Darley, Birstwith, Hampswaite, Scotton Banks, Knaresborough, Little Ribston, Cowthorpe, Cattal, Moor Monkton before reaching its destination. The Nidderdale Way is a 53 mile circular walk starting and finishing in Pateley Bridge. The route, with its own unique symbol seen on finger posts and waymarks, takes you through beautiful and contrasting countryside from the spectacular uplands around Scar House Reservoir to the more gentle rolling pasture and river valleys along the course of the Nidd. Pateley Bridge takes its name from ‘Pate’ an old Yorkshire dialect word for ‘Badger’. In August 1849 a Nidderdale Omnibus started operating between Pateley Bridge and Ripley Station and until 1964 Pateley Bridge was the terminus of the Nidd Valley Railway, opened by the North Eastern Railway in 1862, which ran from Nidd Valley Junction near Harrogate. Pateley Bridge is an attractive market town in Nidderdale in the Borough of Harrogate, North Yorkshire. This market town, on the edge of the Yorkshire Dales National Park, with its spring and summer floral displays has won the Britain in Bloom competition twice and the River Nidd flowing through it enhances its beauty. There are many signs of 18th and early 19th century buildings and shops along the steep narrow main High Street including the oldest sweet shop in England and the best butchers shop in Yorkshire. Pateley Bridge originally relied on lead mining, stone quarrying and flax which can be seen in the Nidderdale Museum. Also well worth seeing in the craft workshops is the glassblower, a potter and a jeweller and there is the Pateley Playhouse ‘Little Theatre of the Dales’. Nidderdale Festival and one of the best Agricultural Shows are held annually on the showground and car boot sales are held on Sundays. Leaving the car park we turn left and follow the road, Nidderdale Way, with the reservoir on our right into Ramsgill. We continue on the road and after crossing the second bridge we turn right onto the road to Bouthwaite only. At the end of the tarmac road we turn right on to the Nidderdale Way again following the footpath sign towards the reservoir. We keep heading forward to pass through Covill Grange Farm and Coville House Farm and continue on the track. When the path splits we bear right, slightly downhill. We continue ahead then take the footpath on the right through the gate, staying on the Nidderdale Way. We follow the path downhill through the field to the head of the dam. At the dam we head straight forward going through the little iron gate to the left of the dam. We keep heading forward through the fields until we meet the road, the village of Wath is to the left, we turn right over the bridge then right again. We now just follow the road, Nidderdale Way, back to the car park. This is an easy walk on minor tarmac road, gravel tracks and grass paths. After wet weather it can be muddy in places. Approx 6 miles allow 2½ – 3 hours using OS Explorer Map 298 Nidderdale. Fountains Abbey, Ripon and Pateley Bridge. This walk is done clockwise. Start point: Car park and picnic area with honesty box at Colt House Bridge. Gouthwaite Reservoir is in Nidderdale near Pateley Bridge in the Yorkshire Dales. From York head towards Ripon and then take the B6265 into Pateley Bridge OR head towards Knaresborough and then take the B6165 into Pateley Bridge. After crossing the bridge in Pateley Bridge take the right turn opposite the show ground and follow the road passing Wath on the right. Continue following the road at the side of Gouthwaite Reservoir and soon after passing Colt House the car park is on the left. There is a sign for the car park and picnic area which says ½ a mile but it is actually 1½ miles. Parking: car park and picnic area with honesty box at Colt House Bridge located towards the northern end of Gouthwaite Reservoir. There are no public toilets the nearest ones are at Pateley Bridge in the recreation ground near the children’s play area and in the short stay car park. For refreshments there is the York Arms at Ramsgill and the Sportsmans Arms at Wath. For more choice there are shops, pubs and cafes in Pateley Bridge.